SCITUATE, Mass. 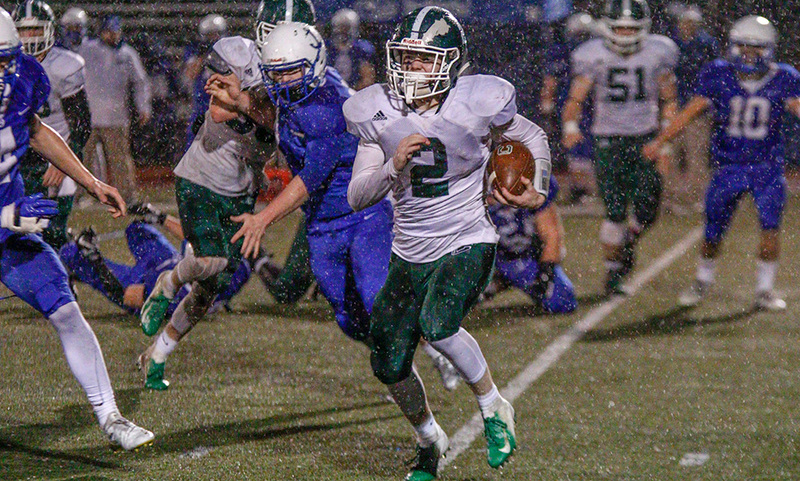 – A lot of the focus leading into Friday night’s Division 5 South Final between Scituate and Canton revolved around the Sailors’ high-power offense. But the story of the night ended up being Scituate’s defense. The Sailors pitched a shutout, limiting Canton’s offense to just over 100 yards and six first downs, to earn a 21-0 decision and the D5 South title, the first in program history. Scituate came into the game averaging over 40 points in its two playoff games, putting up an impressive 57 points in a semifinal win over Holliston. While Scituate’s defense gave up a total of 61 points in its first two playoff games, its defense allowed a total of 69 points all of regular season (including 35 to Duxbury). The Sailors flexed their offensive muscles early on, taking the first drive of the game down the field for a score. It turned out to be Scituate’s second longest drive of the game as they moved 77 yards on eight plays to take an early lead. Facing a third down early in the drive, Scituate quarterback Aidan Sullivan (10/15, 219 yards) completed a 10-yard pass for a first down. The Sailors didn’t face a third down the rest of the drive and Will Sheskey (24 carries, 135 yards) punched it in from 5 yards out for a 7-0 lead just over three minutes into the game. The next three series – two from Canton – resulted in punts, but the Bulldogs nearly had a chance to change the game. After punting, Scituate tried to field the kick on the bounce but a nice play from the Bulldogs knocked the ball free. Canton had two shots at it – one player diving on top but the ball jumping free, and other a chance right before the sideline – but neither player could get a hold of the ball in the pouring rain and it went out of bounds, keeping possession with Scituate. The Sailors made to take advantage of the lucky bounce and needed just three plays to find the end zone. On second on 5, Canton brought a lot of pressure but Scituate had the perfect play call on as Sullivan dumped a screen pass off to Sheskey and he went virtually untouched for a 63 yard touchdown, giving Scituate a 14-0 lead with 9:35 left in the second quarter. Canton responded with its best drive of the opening half. A unsportsmanlike conduct penalty helped move the ball 15 yards, and Johnny Hagan (86 all purpose yards) hit Gersom Rivera for an 18-yard gain to the Scituate 34-yard line. The Dogs had a chance to complete a pass down field but the receiver was held, giving Canton first and 10 at the 22-yard line. But a false start, a two-yard rush, and a run for no-gain put the Dogs in a 3rd and 13 situation at the 25-yard line. Hagan tried to make a play but was intercepted at the goal line. Scituate nearly tacked on another score before half, driving all the way down to Canton’s 23-yard line but Ben Seaman came up with a big sack on third down and Canton forced an incompletion on fourth, keeping the deficit at 14-0 heading into half. A holding call on the first play of the second half put Canton’s offense in a whole and it was forced to punt quickly thereafter. Canton’s defense continued its strong play on Scituate’s ensuing drive. The Sailors got inside the red zone, all the way down to Canton’s 8-yard line. But Seaman came up with a big sack on third down and David Allen broke up a pass on fourth down to keep the Sailors out of the end zone and the lead at 14-0. The Bulldogs offense moved the ball forward on seven straight plays, but faces a 4th and 3 at their own 40. With little time left in the third quarter and a two-score deficit, Canton went for it but Hagan’s pass was picked off just over midfield. Scituate killed a lot of the remaining time with its next drive, needing nine plays to cover 47 yards. It was’t until a 1-yard sneak from Sullivan on fourth down that Scituate added its third touchdown of the game to go up 21-0 with 8:46 to go. “The defense gave us a chance,” Bohane said. “Ultimately we didn’t do enough offensively. We just never got that rhythm that we need so badly. We didn’t find it today. The defense kept plugging away even though they gave up an early score which has been a little bit of an Achilles heel. We needed to make plays offensively and we didn’t but they didn’t make it easy for us. Canton football drops to 8-2 with one game left on Thanksgiving against rival Stoughton. While the future for the Bulldogs looks bright with the majority of its lineup made out of juniors, Bohane stressed how important this senior class has been to this season. CANTON, Mass. – For three and a half quarters, the Canton defense was having its way against the Stoughton offense. The Bulldogs forced the Black Knights to punt on each of their first seven drives, holding the visitors to negative yards on three of those drives. Stoughton had just one first down early on in the fourth quarter. But with just under six minutes to go, Stoughton’s offense finally clicked. The Knights cut a 14-point deficit in half with 5:34 to go, and got the ball back down just one score with 1:56 to play. A big pass play set the Black Knights up in striking distance, but the Bulldogs defense, as it had for the majority of the game, came up with a stop with under 30 seconds to play. On fourth down, Canton junior Robbie Gallery tracked down Stoughton quarterback John Burke for a sack, preserving a 14-7 win for the Bulldogs. Canton’s defense did a nice job bottling up Stoughton’s rushing attack. The furthest the Black Knights for prior to its final two drives was 10 yards over midfield — its lone time into Canton territory through three quarters. 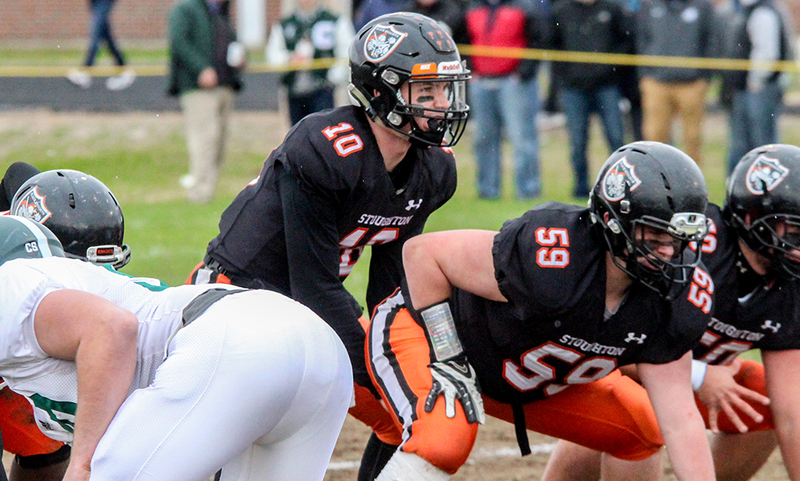 A sack from Owen Lehane on first down forced Stoughton starting quarterback George Currier to the sideline. Burke, a sophomore, took over under center and the Knights had one of their biggest plays of the night — a 22-yard reverse from Ajahn Rue — to spark the offense. After Rue’s run, sophomore Christopher Ais took a sweep and went for 19 yards to get into the red zone. After Canton’s defense stuffed a rush attempt, Burke floated one to the near pylon on the right side and senior Alex Iverson did a nice job fighting through contact and getting a foot down to get the Knights on the board, down 14-7. Canton’s offense did its best to run time off the block with quarterback Johnny Hagan (5/9, 44 yards; 21 carries 121 yards) converting a third down with his legs. But a sack on the next play from Stoughton’s Jerry Brisson put the Dogs in a long distance scenario. Canton gained eight yards on the next to plays but had to punt with two minutes to go. Stoughton’s final drive got off to a rocky start when Canton senior Ben Seaman (two sacks) came on a blitz from the blind side, taking Burke down for a loss of 7 yards. But the Black Knights made things interesting on the next play as Burke lofted one down the left sideline and Rue used his speed to get under it for a 45-yard catch, down to the Canton 30-yard line with 1:09 to play. But that’s when Canton’s defense came through again. A pass and catch from Burke to Ais was stopped at the line of scrimmage on first down, Burke was forced to throw it away on second down, and a pass over the middle was short on third down. On fourth down, Burke was able to buy some time by getting out of the pocket but Gallery came flying in to make the tackle. It was an impressive showing for the Bulldogs defense, which allowed a total of 122 yards while holding the Knights to 0-for-8 on third down. And they did almost all of it without junior linebacker James Murphy, who Bohane called the quarterback of the defense. 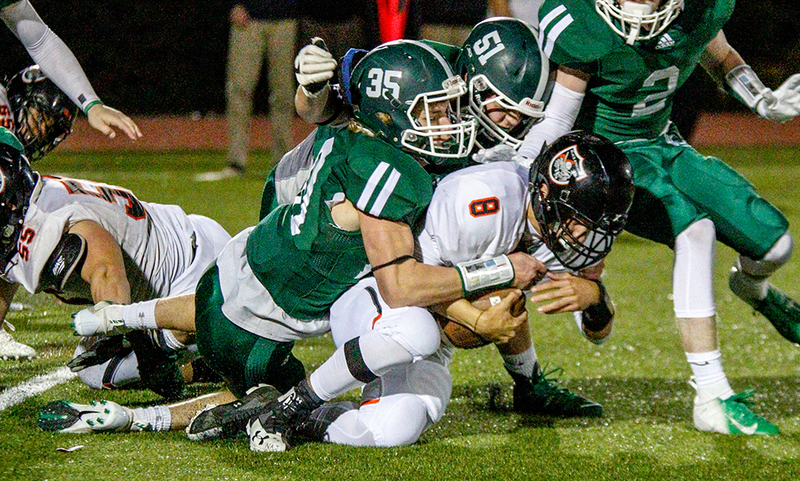 Stoughton’s defense also had a strong showing, forcing the Bulldogs to punt on six times and holding off another drive as the first half came to a close. However, Canton’s offense was able to find the end zone twice — both on eight play, 65-yard drives. After punting on its first drives, the Dogs moved the sticks when Hagan connected with Jace Emma for 11 yards. Hagan followed that with a 20-yard scramble on a broken play, and Gersom Rivera had runs of 10 and 23-yards, the latter converting a third down and getting the Dogs down to the 1-yard line. Hagan took it in from there, following his line in for a 1-yard sneak and a 7-0 lead with 7:23 left in the first quarter. Stoughton’s best drive of the opening half went for 41 yards, all on a run from Iverson. But an incomplete pass and two runs that netted no yards stopped the Black Knights from advancing. Canton’s defense picked up where it left off, forcing Stoughton backward on its opening drive of the second half. After a three-and-out, Canton took over at its own 35-yard line and orchestrated what turned out to be the winning drive. 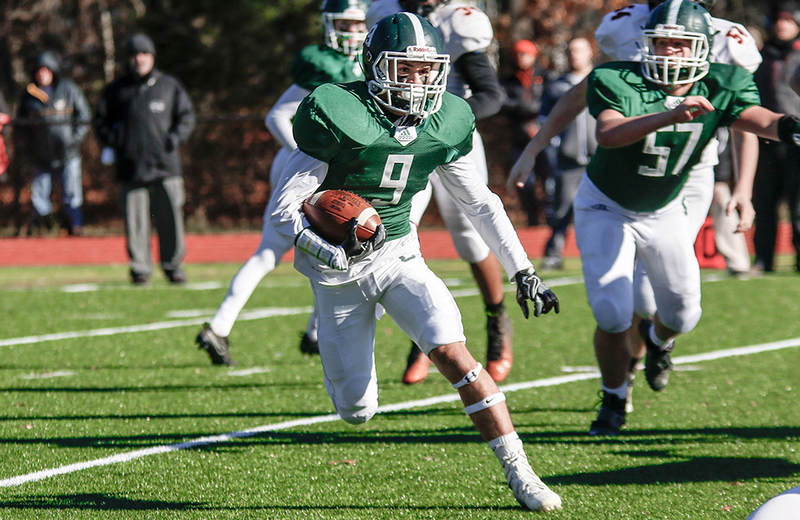 Hagan moved the sticks with a run of his own, connected with Ryan Lentol on second down, got a first down on a Stoughton penalty, and then finished the drive with three straight runs from different players: Rivera for 8, Hagan for 12, and Kyle Fitzgerald with a 9-yard touchdown run. Canton football (5-0 overall, 3-0 Hockomock) is back in action on Friday when it hosts Sharon. Stoughton (2-3, 1-2) hits the road to take on North Attleboro at Beaupre Field.